Provincial court judge K.P. Bazin made an interesting discovery during a visit to Shaunavon last Thursday. While Bazin was in town to preside over cases at the Shaunavon courthouse, his discovery had nothing to do with evidence, although it did lead to some investigative work. With temperatures expected to hover around the 30 degree Celsius mark that day, Judge Bazin made a point of arriving early in Shaunavon. He makes the trip to hear cases in the Shaunavon courtroom on the first Thursday of every month and he is familiar with how warm the building can get under extreme conditions. Bazin’s effort, ironically, turned out to have a bit of a storybook quality itself. While opening the window to the judge’s chamber, he found a piece of tyndall stone with an engraved message sitting on the outside sill. 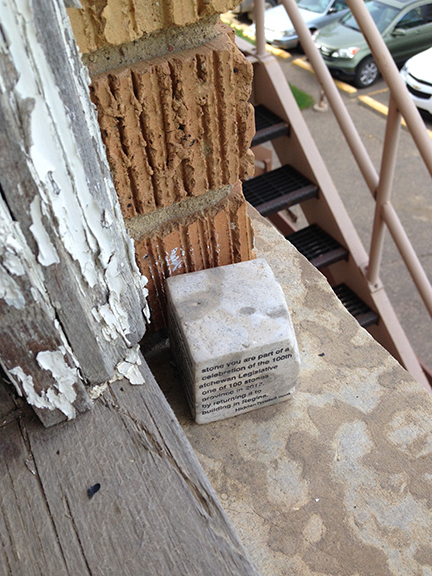 It turns out that the stone had been left in complete secrecy – even staff at the Town Office were unaware of its existence – as part of a public art project by Terri Fidelak in honour of the centennial anniversary of the Saskatchewan Legislative building. In 2012, Fidelak placed 100 cubes of Tyndall stone throughout the province’s landscape in hopes that they would be serendipitously discovered. Each cube includes a message inviting finders to participate in the project by returning the Tyndall to the Legislative building in Regina. There, the pieces will become part of a permanent installation celebrating the cooperative spirit of the people of Saskatchewan. Bazin says he does plan to bring the stone to the Legislature. In her description of the project, Fidelak pointed out that the prairies once drowned beneath an inland sea and that Tyndall stone is what remained after the waters receded and the glaciers passed. Strength was born out of time, and these pieces of ancient history became the sturdy foundations of Saskatchewan’s future when the Legislative building was constructed of Tyndall stone 100 years ago. When she started the project in 2012, Fidelak admitted that it could take years before all of the cubes were found. Many were hidden in locations such as provincial parks, small town communities and places with historical meaning. At the time she launched the project, Fidelak was one of eight artists in residence selected to commemorate the 100th anniversary of the Legislative Building. According to the website, Judge Bazin’s find would be the 40th piece discovered to date. A former Swift Current lawyer, Bazin has served as a judge of Swift Current Provincial Court since 2014. He previously served a three year stint as a judge in the Estevan court. Bazin started practicing law in 1985 when he joined the MacBean Tessem law firm and was appointed Queen’s Counsel in 2005.